2013 Kawasaki Brute Force 650 4x4i. Picture credits - Kawasaki. Submit more pictures. This highly capable ATV provides superior V-twin power, sound and smoothness, plus a strong 4-wheel-drive chassis and four wheel independent suspension to deliver an unbeatable combination of performance, handling and value. 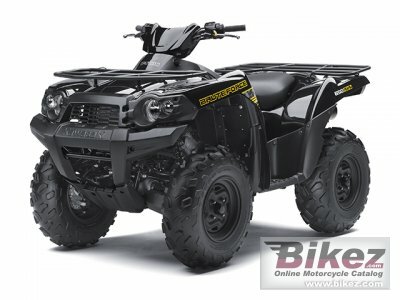 In other words, the Brute Force� 650 4x4i ATV is a superior choice in the middleweight category. Price as new (MSRP): US$ 8199. Prices depend on country, taxes, accessories, etc. Front suspension: Dual A-arms, two shocks with five-way preload adjustment / 6.7 in. Rear suspension: Dual A-arms, two shocks with five-way preload adjustment / 7.9 in. Seat height: 904 mm (35.6 inches) If adjustable, lowest setting. Ask questions Join the 13 Kawasaki Brute Force 650 4x4i discussion group or the general Kawasaki discussion group. Rate motorcycles you know and help your fellow riders to find the bike that is right for them. Bikez has the most users and the most extensive motorcycle rating on the net. It includes reliability, design, engine performance, accident risk, repair cost, offroad capabilities, racing track capabilities and touring capabilities. The ratings are also used to rank the 100 most popular MC models each year since 1990. The lists	are adjusted weekly as new ratings are added. You can check out the rating of the 2013 Kawasaki Brute Force 650 4x4i and compare it to other bikes here.